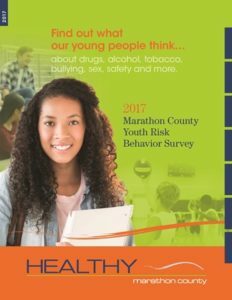 In 2015, a partnership between all 10 public school districts in Marathon County, the Marathon County Health Department, and the University of Wisconsin – Stevens Point (School of Health Care Professions) resulted in the creation of the first ever Marathon County-wide Youth Risk Behavior Survey aggregate data set. 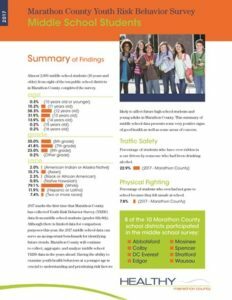 The Wisconsin Online Youth Risk Behavior Survey (YRBS) is conducted as part of a national effort by the U.S. Centers for Disease Control and Prevention by the Wisconsin Department of Public Instruction (DPI) to monitor health-risk behaviors of the nation’s high school students. These behaviors, in turn, result in the most significant causes of both mortality and morbidity during youth and adulthood. The behaviors monitored by the Wisconsin YRBS include traffic safety; weapons and violence; suicide; tobacco use; alcohol and other drug use; sexual behavior; and diet, nutrition, and exercise.